Well here it is, the post everyone has been waiting for me to write. I installed a floor made of brown paper and polyurethane in my boy’s room last year (read that post HERE), and since then I have gotten a ton of questions about it. The original tutorial post currently has 645 comments, most of them questions that I have done my best to answer and keep up with. I’ve gotten nearly the same amount of e-mails as well. So basically, y’all want to know more about my floors. Well, your wish is my command. Just as a refresher, here is the floor the day I finished it…. Let me just start by saying this…we are not easy on this floor. It gets abused, big time. It’s gets pelted with matchbox cars, wooden trains and plastic dinosaurs on a daily basis. It gets jumped on, wrestled on, and slid across. My kids drag their cribs around to make forts and caves. It gets liquids spilled on it… sippy cups, potty training related incidents, once it even had an entire humidifier spill that I didn’t find immediately. Suffice it to say that it doesn’t look perfect, but I’m impressed with it anyway. I’ll be papering my guest room soon (already ripped out the carpet), if that tells you anything. Alright, now that you’ve seen the overall floor, let’s get a little closer. Here is the biggest scratch we have (it’s about 6 inches) and you can also see all the little dents and scratches around it. I have no idea how it got there, but that answers one of the main questions I get…”does it scratch?” Yes, it does. The good news is that even though it scratches, it is fixable with another layer of sealer. This scratch is a doozy, but it is just in the sealer…the paper below is in perfect condition. All the paper on the floor is in perfect condition actually, nothing has gotten past the poly. My youngest son sleeps in a mini crib, and it has wheels. The plastic kind, like a cheap office chair. My boys are constantly moving it around..mostly back and forth, repeatedly, for hours (pretending to be vicious caged animals when they should be sleeping). So this is what happens when plastic wheels roll over paper bag floors 10,000 times. This post isn’t all good news though. I have one area that looks terrible. Last month Adam and I were finishing up planking the boys wall, and the last step was to caulk between the floor and the new baseboards. To do this I put painters tape on the floor, caulked, and pulled up the tape for a perfect caulk line. I was working my way around the room, and things were going great. I was almost done with the floors and walls in the boy’s room! YIPEE! All the poly came up. ALL OF IT. (insert expletive here). So here is my problem corner – all the missing poly was done by me, none of it came up on it’s own. So obviously I have to reseal the floor. It isn’t a big deal, I just want to make sure that it the way I’m doing it is the best way. When I did this floor I simply copied the tutorial over at Lovely Crafty Home. Her tutorial is great, and she recommends oil based stain with water based poly. We all know oil and water don’t mix, but the water based poly she recommends is specially formulated to go over oil based stain. She did her whole second story with those products and recommends them, so I used them. Besides, no one wants to use oil based poly if you can avoid it, that stuff is nasty. And I have never liked water based stain, so her combo makes sense to me. Although, while I am really really pleased with my floor, I can’t help but wonder how other methods and products would work. Is there a better way? I aim to find out. So far I’ve been pretty surprised by some of the results and I can’t wait to share them with you! Has anyone here done a paper bag floor? What products did you use, and how is it holding up? If you wrote a blog post about the process please leave a link in the comments! I did them in my main living area and they look horrible. I did them just like you did and everything scratches them! They were so beautiful at first and I’m really bummed. We plan on covering them with the tile that looks like wood now that I have a great dane. Oh no, I’m sorry! Did you have a pet the whole time or just now get one? People are always asking me how it holds up with pets and I have no idea, since we don’t have any. Yes we have two and three kids. We also did a half bath and it still looks perfect! I wouldn’t recommend the flooring for any pets over 20 pounds. I still like it better than the disgusting carpet! Good to know! And anything is better than carpet! OK, we did our floors in September. We have two dogs (1 medium and 1 large) and I’ll say that they don’t hold up so well with dogs. At least ours haven’t. I cut their nails, but they still have found a nail hole or two to punch through. I absolutely love the look of the floors, but with dogs, not necessarily a great match. We did splurge for the Bona Traffic too. We don’t count it a total failure, but we will have to replace them at some point in the not-too-distant future. The first problem was using a water based glue and sealing it with a petroleum product. Never mix water-based and petroleum based products. I’m going to try this and use lacquer to lay the paper down and several coats on top. Lacquer is harder than polyurethane, so scratching will be minimum. Also, there is a product that can be added to the lacquer to make it even harder, thus providing a very hard surface. Polyurethane will set up, but it never fully hardens; it’s always kind of rubbery. Poly is great for outdoor projects. I did experiment with it and it works great over the top, but does not work as a glue. From what I’ve read, as long as the poly and the stain are water-based, it should adhere to the paper bag layer. However, everybody says to stay away from the water based stains because they’re messy and the results do not look as nice as when using an oil-based stain. There’s also info about applying the poly: it too thick or thin it can become milky etc. I sealed my sample board with 5 coats of lacqure and it looks very lovely; it has a nice texture to it and clean up was easy. I agree that epoxy should be the first sealer used followed by a couple of poly coats. I have not tried the paper floor, YET, since I am just now seeing this idea, but I have made a penny floor. It looks great and is holding up well. I used a marine epoxy for the first 3 layers then applied 3 layers of poly. The epoxy I used was considerably more expensive than the poly, but it has created a very hard surface that is protected by the poly. You know, Formica and other like brands of countertop are basically made of paper. It is way tougher because machines make it and they use heat and pressure and different sealer, but it is the same idea…. And as far as final surface HARDNESS you can buy a product called “Street Shoe” that is used on hardwood floors in shopping malls. It is a polyurethane, but CURES really glass hard. I did a paper floor in my GrandKids room. I used Elmer’s Glue diluted 50/50 w/H20. After the floor dried I sealed it with an oil primer. Then I painted it a cream color. I stenciled around the edges and then glazed it. I applies about 5 coats of water based poly and it looks great! Do u have pics?? ?would love to see it. I think that I would try doing an epoxy finish over it. I did a paper bag-floor in my Yoga room. So far, I’m very happy with it, despite the pain of putting it down (I had to re-do the paper 3 times). But it looks just beautiful and I haven’t had a ton of problems with scratching yet. But, my floor is still very new and probably won’t be a super high-traffic area. However, I will be doing the floor in several other areas in my home soon. We are just getting ready to do the basement (on concrete). So this will be a new adventure. 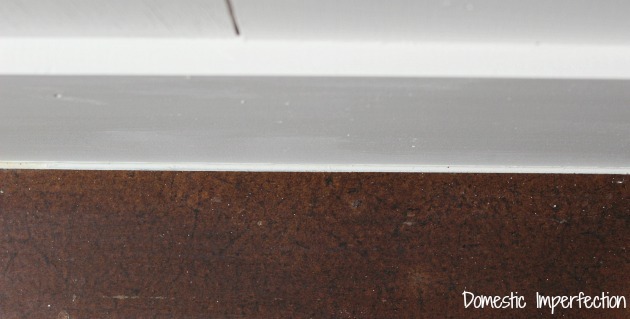 :) Do you plan on sanding the boy’s room and adding more poly? If you do, I’d love to see what it looks like when you’re done. I read your entire post when you left a link last time, I can’t believe you have to do the paper three times! I left a comment on your post but I don’t see it now. Did you get it? That’s weird. I’m not sure what I’m going to do in the boys room, I’m going to wait till I’m done experimenting to decide. I’ll keep you updated for sure, I plan to post about my results, the resealing, and guest room floor. :) Yeah, the re-papering was painful, but so worth it in the end. Also, lots of good learning there, so I’m okay with it. I didn’t see a comment from you, but I’m new at this blogging thing, so who knows what happened. :) I’m looking forward to your updates! Keep up the enjoyable posts. That is such a cool floor and it’s held up to a lot of use! I’ve never seen something like that before! Yeah, I might not be posting such a good review if this was in my kitchen. I’m okay with the scratches in the bedroom, but in the main part of my house they would bother me. Plus adding another layer of poly each year would be a much bigger deal. And since mine is on concrete I hadn’t thought about the wood grain being raised and wearing faster, but that is definitely something to think about. Sorry yours haven’t worked out so well, and thanks for sharing what you’ve learned! Hmmm, the milky poly is a little weird. I’m super impressed with the HUGE test board and can’t wait to see the results! Wow! If the DIY world had Research grants to give out I would definitely give you a big one for all the R&D work you are doing with this project we all love! 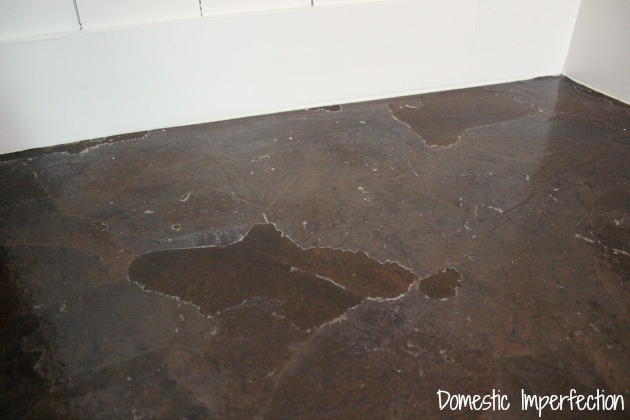 I don’t think I have the ambition to do my concrete bsmt floor but think about doing my kitchen countertop.and use a countertop sealer for it which seem to be hold up for paint and the faux marble various transformation kits like the one Rust-o-leum has. 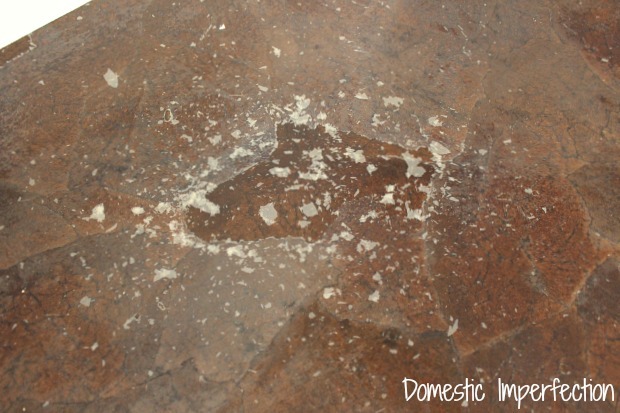 Have you tried any of those countertop sealers on the flooring? I was thinking of faux finishing my kitchen counter top, but was going to use the floor sealer instead of the counter sealer– thinking it would hold up even better. You’ll have to let us know how the project goes. I don’t plan on doing this till closer till fall. I want to put in a off white Farmhouse Apron sink so need to cut the countertop first. I have the country style beadboard kitchen in off white/bisquit color appliances so wanted to use the ivory paper and a black stain to complement my aged bronze (black) hardware and black faucet tap. I will have to follow suit of what Ashley is doing and make some sample boards first and will compare a countertop sealer against what Ashley reports on. Can’t wait for the next installent blog! I’m a wood flooring contractor and when I saw the first couple pics it looked like classic delamination of finish to me. I instantly cringed when you mentioned tape, I’ve seen it tons of times on wood floors. The finish simply didn’t bond. Oh and we’ve been using waterborne finish over oil sealers and stains for years, it’s an accepted practice in this field. I’m so glad you commented! It’s good to know that professionals use water based finish over oil based sealers, that makes me feel better. As far as the delamination, do you have any insight as to what might have caused it? It’s just in that area and I’d like to avoid having it happen again. Thanks! Honestly it’s hard to say. 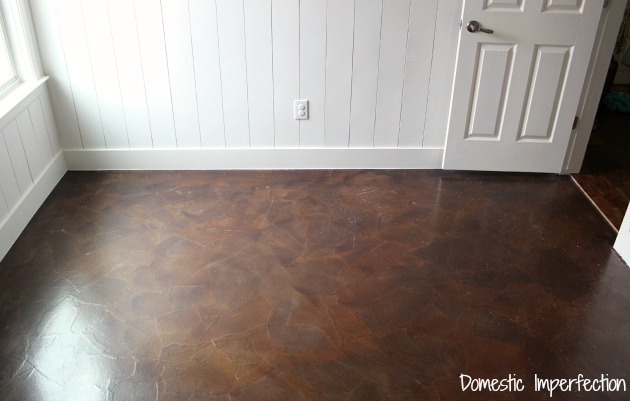 I found your blog when my aunt shared the first post about the paper bag floor on facebook and I was a little skeptical at that time that any finish would bond to paper soaked in thinned down glue. I’ve forgotten what kind of finish you ended up using, but when we do maintenance coats on existing floors we typically use an isocynate hardened waterborne finish such as Bona’s “Traffic” and the customer is explicitly told that there are no guarantees that the “screen and coat” (as we call them) will bond. If the finish doesn’t bond then it will just flake off and the investment is lost because it will need to be resanded, so we always do test spots in inconspicuous areas such as behind a door or in a corner. According to Bona’s tech line, the isocynate hardened type finishes generally have the best chance of bonding to existing finish, so we rarely even try with oil based or single component waterborne (which is what I’m guessing you used). First I guess you’d need to determine what exactly delaminated here, did the finish come off the paper, or did the paper come off the concrete? When you tap on the paper, does it feel hollow underneath or is it still solidly glued to the concrete? If the paper is moving then no finish out there will bond to it so that’s number one. If it’s still solid then you might try to acquire some 2-component waterborne, (it’s not typically sold to the public but if you contact a local wood flooring contractor they might sell you some from their supplier, but it’s north of $100/gal (yikes)) and do up some samples, you’ve clearly learned the importance of that I’ve noticed. When we test the bond of a screen and coat, we usually just start digging at it from the edge with fingernails, but the most brutal test is to cut into the finish only with a razor blade in a grid pattern, then put painter’s tape on it and push it down really hard. Then pull it up and see how many squares of the finish come off with it. The potential problem is that these finishes are made specifically for wood flooring which happens to be one of the most used and abused surfaces in a house so unfortunately it might just be possible that the paper bag floor just isn’t feasible. Another possibility is to use a different kind of glue for the paper, something like an epoxy. That sounds a little daunting to me given the mess you went through using regular wood glue so that might just be a terrible idea, I’m just trying to think of something that finish will bond to. I suppose you could post on hardwoodflooringtalk.com and get some opinions? Maybe even using the 2-comp WB -as- the glue could work… samples samples samples! I really appreciate your insight, Everett. We’re the early side of the paper based floor and I’ll certainly be purchasing the Bona Traffic as well as making sure my paper sticks. I’ll try to remember to come back and let y’all know how it went. There is a product available in building supply stores called “Drawtite”. One of the first adhesives I found info for when trying the floor. Recommended for walls but works on any clean, dry surface as quality adhesive. Years ago a woman I knew did one wall in her library with brown bags. Looked awesome and can’t walk on walls so it lasts and lasts. I think an accent wall done like this is a great idea. I’ve honestly never heard of paper bag flooring. This looks interesting. Funny about that area behind the crib, hey? Too bad. The rest still looks nice, though, and it’s good that you can poly over it to shine it up. It looks great with the planked walls, too. Is the wall that the strip of sealer came off an “outside” wall? Meaning on the other side of the wall is your exterior vs just a shared wall btwn bdrms? Or shared with the bthrm? Thinking about temperature or humidity factors in regards to the peeling mystery . . .
It’s mostly on an inside wall, it backs up against the closet in the master. That was a good guess though, I hadn’t really thought of that. I had another reader ask it thats the corner that got sunlight from the window, but it’s not…it actually the darkest corner in the room. It’s such a mystery! A flooring professional offered some really good insight in a comment above, I’m trying to take his knowledge of hardwood sealers and somehow apply it to fixing my paper floor. One final attempt at this unsolved peeling mystery. . . you know how when you try a new product they always say try it first in an inconspicuous area which in this case might have been under the crib? Did you start the papering and/or sealing process in that area and maybe have tested, altered and modified the process and products several times in the human trial and error system that we know and luv hearing about as you perfect your domestic imperfection? Haha! You know, that IS the side that I always started on with each step, since it is the spot furthest away from the door. Maybe you’re onto something! I didn’t try anything out there that I didn’t continue throughout the rest of the room though…but maybe I did things faster or slower or thicker or thinner, since it was my first pass. Thats a great theory. My other theory is that my potty training boys might have messed it up with their, well, potty training…or lack thereof. The Toddler wildcard theory has so many possibilities, the acidic value of urine, or even spilled apple juice might interact with the sealer, and we all know the best spot for a fort is under the crib and what happens in forts stays in forts. I say call in the 2 suspects for questioning! Their names will be withheld from publication as they are minors. I’m pretty such there is a garden that could use weeding in your area or toys to be picked up and they could provide community service instead of doing hard prison time if found guilty – but you can be the judge on that one lol! Back to the serious side – one more thought on water and cleaner. When I wash floors in a room I always start in one far corner and work my way out. When I start the mop is wetter and has more cleaner on it and dilutes/dries out as the work progesses. Do you start under the crib? Is your product friendly for the sealer? I also recall a blog you did on how your kitchen faucet tap drip was damaging your countertop. I always meant to ask you about your water as I have issues with this too. In my bthrm I keep a small sponge under the tap to reduce the high maintenence of this and put the sponge away when company is coming. (Yup looks like crap, not a featured blog you will ever read anywhere, but I keep thinking I have better things to do than constantly be cleaning up clean water drips!) I have farm well water – hard water lots of calcium to constantly spot the stainless sink, a bit of iron for rust spots and a bit of sulphur to gradually eat through my faucet fun things like that. What is your water like – are you on a well or municipal water line? I am curious what other types of paper u tried to use. I was thinking how would colored construction paper hold up. Maybe too pourus? I’m curious if anyone has tried this with an epoxy over the top instead of the poly. I would think it would be worlds more durable! I have seriously considered doing epoxy. I did a penny countertop in my kitchen and used epoxy…the stuff is insanely durable. The only thing holding me back is how expensive it would be to do a whole floor, plus you would never be able to get it up if you wanted to do something else. I did a paper floor in my downstairs hallway. It gets tons of traffic too. I used the same tutorial you said you used. The exact same things happened to me when I taped off on the floor to paint the trim! We also got a giant scratch when we were moving out some furniture that was a tight squeeze, but the paper was not damaged, just the finish. I did mine last June. It looks about the same as yours does. Except I haven’t had any pealing like you have. We also had a leak under a bathroom sink that spilled out onto the floor, and sat for some time before we found it. It made the floor peel up right there in the doorway, which happens to be one where I did not put a threshold. Yet because I plan to replace that bathroom floor. I think once, I finish that floor, I can reglue the edge down and cover most of it with the threshold. I plan to sand down the floor a little and put a couple more coats of poly on it. I think that will make it look like new again. A small price to pay for the low cost and look of this floor. I won’t mind if I have to do that once a year. It shouldn’t take long. I will be following along to see what happens with your experiment! Trying to determine if it best to use a primer on raw rough concrete before I start whole process. I call concrete appearance that because that how it looks after I removed the carpet & padding. I have desire to have a bumpy/sandy looking finished floor. Have you ever considered laying a wood sub floor out of 4′ X 8′ sheets of plywood? Thanks!! You could definitely lay a wood subfloor if that’s the direction you choose. Just make sure to put wood filler in the joints and sand smooth, the joints will show if you don’t. Thank you for the update! Just laid the stain on my new paper floor yesterday! I was struggling to decide between Provincial and Dark Walnut, and let hubby decide, and we went with the walnut, but now I feel it’s darker than what I wanted. Can’t see as much of the veining and cracks in the paper as in your floor, which is what I love about this flooring. But that’s OK, maybe they’ll be more visible once I poly, and regardless, it’s still better than carpet! Thanks so much for your site and posts, hugely helpful! 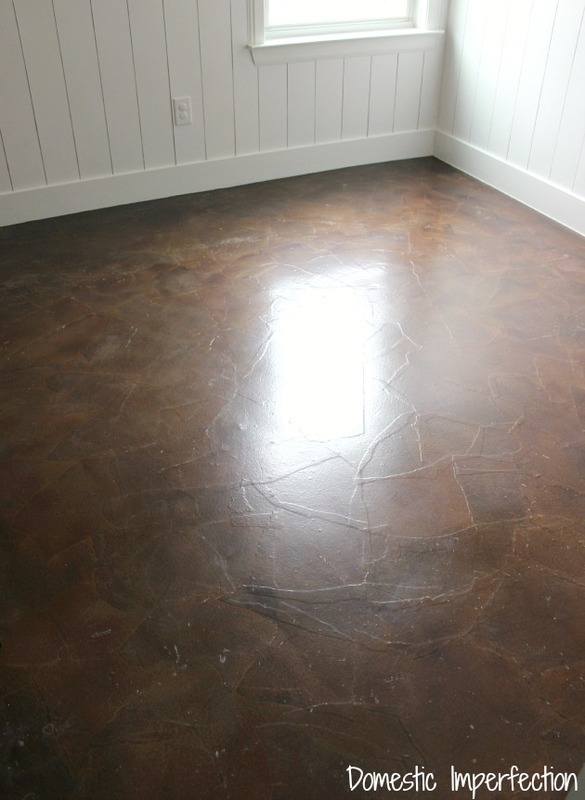 We have stained and sealed concrete floors, and had a problem similar to yours. After speaking with the manufacturer of the sealer, they sent a rep out who diagnosed it as “blushing”. They think there was a tiny bit of moisture trapped between the first and second layers of sealer. Maybe that corner of your room had a bit of moisture before you used the poly…makes sense as it appears to be an exterior wall. Has Anyone Tried It On Stairs? I used the paper technique on my cherry desk top..But I used brown paper lunch bags.I used DIF wallpaper & Border Adhesive.I stained it with Minwax Polyshade stain.. Then sealed with 4 coats of Minwax fast drying Polyurethane.. It turned out so nice..It’s been holding up very well so far but it’s only been done about a month..Now if I decide to do one of my floors I will use the reg rolled brown paper it is much thicker…We are very happy with the results.. Under my carpet, I have asbestos tile and under the tile is a black looking glue, I think it would be impossible for me to remove the glue. I have carpet….and am on a very small budget. How do you think the process would work if I applied it to the floor on top of the glue? meant to say I hate carpet! Can you take your Ghost picture and compare to one yr later? I wonder if the white ghost areas are the ones that are peeling or if they show any different wear. I always wondered if it stayed white as Builders paper is dif than Kraft paper. Builders Paper is supposed to act as a moisture barrier – you can use it as a drop cloth when painting and the paint will not seep thru. I don’t know if it is a rosin or light wax coat or what would be on it but would assume it would stop the penetration of the glue, stain and maybe the sealer did not set right and cause peeling? I have no idea what they used for glue but whatever it was – it work’s great. My congratulations on the floor, you did an outstanding job. This floor. Will it work in a high humidity area? Can function…one teen and one twelve year old. Having sanded and varnished floors, used a product called p67 which is what is used on basketball courts, and has both a varnish and hardener in it, only down side being its sticky, ( think superglued fingers) has awfull fumes, and needs applying quickly, but two years on no scratches, so wondering if that would work with this, it’s extremely hard wearing, with little upkeep, any thoughts? Hello, I was wondering how much poly it took you to do the bedroom. This is about the size of the room I am looking to do and I want to have all my materials before I start. I want to say it took me an entire gallon, I did about a dozen thin coats. I just finished papering another bedroom (exact same size) and used the Bona Traffic I discovered in this post and I only used slightly less than half a gallon. I have a mobile home and was planing on doing this when I found that only parts of the home had linoleum under the carpets…the rest is just board…can it be done on the board or should I lay something over the board first ? You can put the paper right over the wood. Just make sure to fill any gaps or cracks and sand smooth before you start, any texture on the floor will show through the finished product. HERE is a link to another tutorial where she did it over wood. Hi, Ashley. Your blog is one of several I used for research before installing a brown paper floor in my own home. Thank you! I just came across this follow-up post, and I’m happy to hear your floor treatment has held up for the most part. I did mine a little differently than most. I cut the papers into various sized rectangles rather than ripping, just for a different look. They aren’t perfectly square, and I’m completely ok with that — that’s the look of this floor, no? Also, I wanted to avoid oil-based products, so I tried a RIT dye technique as suggested by http://www.4you-withlove.com/2012/02/paper-grocery-bags-elmers-glue-rit-dye.html — However, I did NOT like the color. At all. It went on too purple. Next, I applied a wash of watered down dye, hoping it would help the color. Still, no. And blotchy. And I was also concerned about colorfastness of the dye. Notes: I don’t think it would have worked as well had I not applied one coat of poly before applying the leather dye. The dye still went into the paper creases without over saturating the paper (except a few spots I missed; didn’t ruin the overall look, though). Also, it was easy to control the amount of dye (and thus color variation), since I was rubbing it on by hand. Caution: streaks may show if one isn’t careful applying the dye–> I recommend rubbing rather than brushing it on. I’ve done all the experimenting I’m going to to, but I can tell you that I think sheet music would work great and look very cool in a music room! Hi, looks great! I’m wondering if anyone has tried cutting the paper into “planks” for a wood plank look. Could be interesting! Ronda, That’s what I did, although I wasn’t going for a wood plank look — I just didn’t like the look of the torn edges on my sample board (at least for this room) and was frustrated with the way it was tearing. The look is closer to a cork floor, or a cross between cork flooring and leather? It’s definitely unique. If you scroll up to two comments previous to yours, I have described my process, which is a variation of the one in this blog post. The blog posts on this site and others were extremely helpful (thanks, Ashley, you brave soul!!. I have started to paper bag a floor in my house and had some issues come up. We took out our old carpet and pad and found a standard plywood floor. The floor has some spots where liquid has leaked though the carpet and pad and made some dark spots on the wood. After gluing the paper down those spots have bled though the paper. Also there are some spots that are white in color on the wood from spills I guess they have bled though also. I tired sanding one of the spots that bled though the paper white and placing another piece on top of that and it bled though also. I would try sanding those spots down to the wood (just like you already have), adding a layer of sealer directly onto the wood, letting it dry, then adding a new piece of paper. The poly should keep the stains from leaching onto the paper. I think just about any kind of poly would work…what were you planning to use as the sealer over the paper? You could probably just use that. I was gonna do this in my basement area thats not carpeted any longer due to cat spray…yuck. Then i saw the post about PETS. two cats and a saint bernard. Probably not my best option. I really hate laying tile down there but there is kitchen cabinets and counters also beside the “spare fridge” (which stays almost as full as the one in the kitchen so its not really a spare) so i guess tile will look best after all. I was gonna try a Brey stain over it to go with all the dull and gloom in my son’s apartment in the basement but i dont think ill go to this much trouble just to have the pets mess it up so quickly. Im getting up there in age and my bending is limited as it is here lately so that is a LOT of being on the floor for me…. (terminal illness kinda puts a damper on all the things youd LIKE TO TRY sometimes) I will come up with SOMETHING for down there before something happens to me cause i cant stand the grey slab and stuck on carpet from adhesive and such much longer. 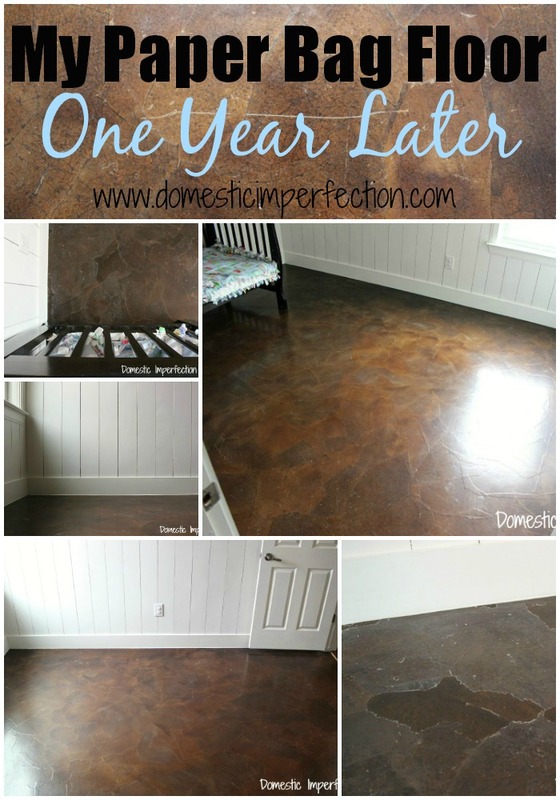 I did the paper bag flooring in our homeschool room and at first it was gorgeous, but I would say about 2-3 months later it was awful. We have an English Mastiff and the floors just couldn’t stand up to her despite the 23 coats of poly we applied. Even now, about 1 1/2 later, the areas where the dog does not frequent are looking worn. I’m okay with it since its in our classroom, but I would never put them in another room again. Though beautiful at first, just to much work. I have to agree with you. I love my floors (I’ve done two rooms) and don’t regret doing them at all..they are beautiful and cost effective. Mine don’t look awful (maybe in places) but personally wouldn’t put them in a main living area and won’t be doing them at all in our next house. Hi Rebel, I was wondering what kind of paper you used (such as craft or builders) and what type of sealer? Just curious since yours seems to be holding up well. In my main bathroom I used a roll of brown paper from Lowes, $8.00. Then I took it outside, unrolled a lot of it and spray painted in the air above it ( so the paint fell on the paper) a green and a bronze, looked marbled. I cut it up in rectangles, glued it down about a 1/2 inch apart on my pre painted floor (grey), then put 4 coats of polyurethane, lightly sanding after each coat. We had it down for 13 years. Just now remodeled our bathroom and put vinyl down. It was still in great shape, got a lot of complements on my “tile” floor in those 13 years too. Can i ask what kind of poly you used if you can remember? Oil based? Brand? I actually did the second room with water-based poly and it did not have the deep, rich shine of oil-based. So the last few coats I used oil-based and that helped a lot. That room is still the most mellow looking but it’s nice in its own way. I have not experienced any peeling or other damage to the floors. There was 1 scratch I found which I fixed by sanding it and brushing on some poly. You would never know it was there. The floors do tend to collect dust so you have to stay on top of that. But wood floors do too so it’s not a disadvantage specific to paper bag floors. The only regret I have is that I’m trying to sell my house now and some people that have looked at it just don’t get it. What ratio of RIT dye to glue did you use? Hi Ashley: I just did my bathroom floor with the construction paper and supplies from Home depot. . I paper bagged over my vinyl floor. I prepped the floor by cleaning it with TSP and then lightly sanded it. I used Varathane no order Polyurethane (heavy use Formula) water based as the glue to lay the paper down with. I purchased 2 quarts of it. I lightly stained the floor with minwax wood finish English chestnut 233. I soon realized I needed more Polyurethane and purchased the gallon but it was the Varathane floor finish. Three coats went over the top of the floor to seal it. The floors look beautiful. Is there a way I can send you a picture of the floor? Thank you for all your suggestions. How long does the entire process take? Sounds like a lot of dry time. I’m wanting to do this in my kitchen but I have 3 kids sip being without the kitchen could be challenging depending on time table. We have had no problems at all! I recently covered the tile in my bathroom and kitchen with paper flooring and it looks amazing! I did these with water based poly then when they dried went over with 2 coats of oil based poly. Has held up for 5 years with dogs and kids. No problems. You have to make sure the water based poly is totally covering the paper and dry. If the oil poly gets into the paper it turns it dark. thank you for posting all of your efforts and observations!!!! I followed your instructions to a T last year, chose a room that wouldn’t receive much traffic and one year later the floor is still beautiful. I wish everyone had your brains and sense of curiosity & humor – the world would be a better place. Now I’m ready to start experimenting with every other surface and room in the house, so your update is perfect. We call this place ‘base camp’ while we regenerate the 21 acres around it so I don’t have to worry about being too foo foo if experiments go sideways… and yes I have impeccable sense of trends and beauty (staged multiple expensive homes in Seattle). I’ll be sure to document each step and how the room gets used. Thanks! I’ve seen his done over linoleum floors before. The trick is to lightly sand the floor first with some rough sandpaper, otherwise it will be to slick and the paper will peel right off. I layed the paper paper bag floor in my teenage daughters room. We had a chocolate lab that was down right crazy! I used varathane and the floor has held up nice over the past year. The nice thing about these floors if something does scratch it very bad all you have to do is glue another piece of paper over top of it and polly over it. They are a lot easier to fix that would floors. What kind of floor did you paper over? I want to do this in my fireplace room but I’m not sure it would work on top of tile? I papered over concrete, but I experimented with tile and it worked great. You will be able to see the grout lines through the paper though. i just saw this on pinterest .. my mother is an interior decorator . My family owned a business and we did a little of everything , we did flooring , I ran a crew doing floors , paint, etc . I know what the problem is . Yes , I have redone floors I cannot even tell you how many times . Hardwood, tile, epoxy based finishes etc . It’s water based poly . .. Water based poly NEVER hold up especially on high traffic surfaces and NEVER EVER on floors .water based poly almost always on furniture that will be gently used only . You need OIL based poly . Preferably Sparthane polyurethane ( the type used on ships ) it holds up incredibly well and def will survive toddlers ? I’ve seen a poly that is for floors…….. I didn’t look at it closely whether it’s for oil based or water based… You might want to check on that it for floors right on the outside of the can. I followed your instructions and my floor came out quite nice however it is dull. Not shiny at all. Can you suggest something I might coat it with to get that pretty glossy look? What kind of sealer did you use and how many coats did you apply? Also, mine looks shiny in the original pictures but dulled fairly quickly. My friend Nancy introduced me to the paper bag technique more than 40 years ago. At the time, we used gold foil paper and sprayed it with brown enamel, much of which we then wiped off. Then the paper was torn into irregular shapes and applied to a coffee table top with Elmer’s Glue. The finished product looked like old leather. It was beautiful! Then, about 20 years ago, this same friend and I did our basement floor, using grocery bag paper that we sprayed lightly with mossy green, deep red, and a bit of white paint. We wiped off much of the paint and then torn the paper into irregular pieces, which we glued to the floor with Elmer’s Carpenter’s Glue. After letting the floor dry for a few days, we applied many, many coats of spar varnish. 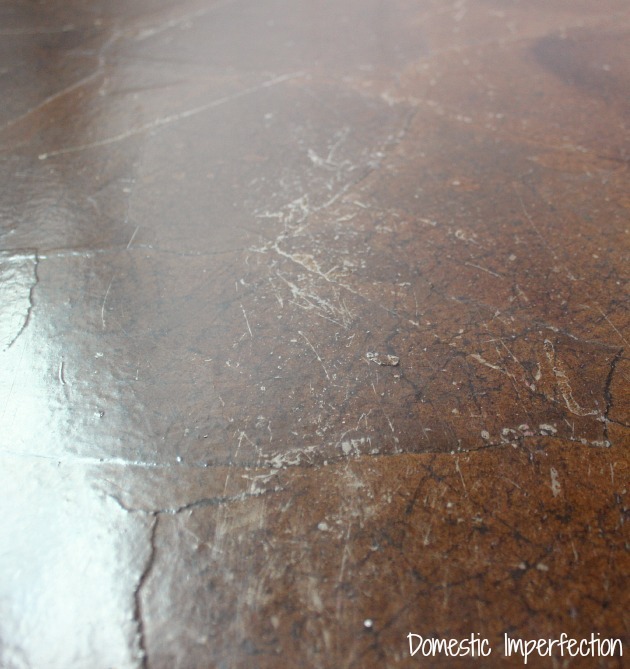 That basement floor finish wore like iron and was often mistaken for stone. My friend and I call this the Larmoyeux Technique because that’s my friend’s middle name. I just saw on another diy (wallpapering the floor! )flooring pin that if your floor clouds when exposed to water you should add a coat of boat varnish. I did a paperbag floor with walnut stain and POLYVARNISH for floors…..its now year 3 and i couldnt be happier. i put 4 coats. i have it in the hallyway and laundry room, replaced the washer and eventually the dryer and no scratches!!! the floor got wet from the leaky washer and turned white, but once dry was just fine. a floor varnsh might be an even better top coat but its expensive….. 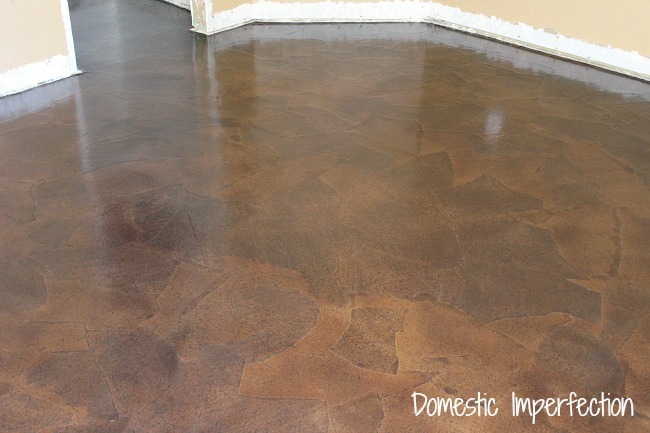 I did the brown bag floor in 500 sq ft(living room,dining room,and 2 hallways)I filled all cracks in the concrete and then applied oil based kilz on it before applying the paper. I sealed with 6 coats of water based poly for floors and let it cure for 30 days before placing anything on it. This was done in 2012 and I have had no problems. Water based doesn’t do well on top of oil based. If the stain was oil based and you coated it with a water based sealant, there is no real adhesion. I did this four years ago in two bedrooms and a dining room. The bedrooms were subflooring but the dining room was linoleum (glued to cement). We’ve not had any issues in the bedrooms but, in the dining room, we got a tear somehow ? while scooting the fridge across the floor. However, I was able to place another layer of paper on top of that small area and continued the process as usual. Looks great again. I wish I could post a pic because I didn’t crumple or tear the paper. I just used strips of craft (very thin) paper. I stained them to look like wooden planks. It looks great, but we don’t wear shoes in the house either. Wearing shoes in the house is like sanding the floor ever so gently everyday. 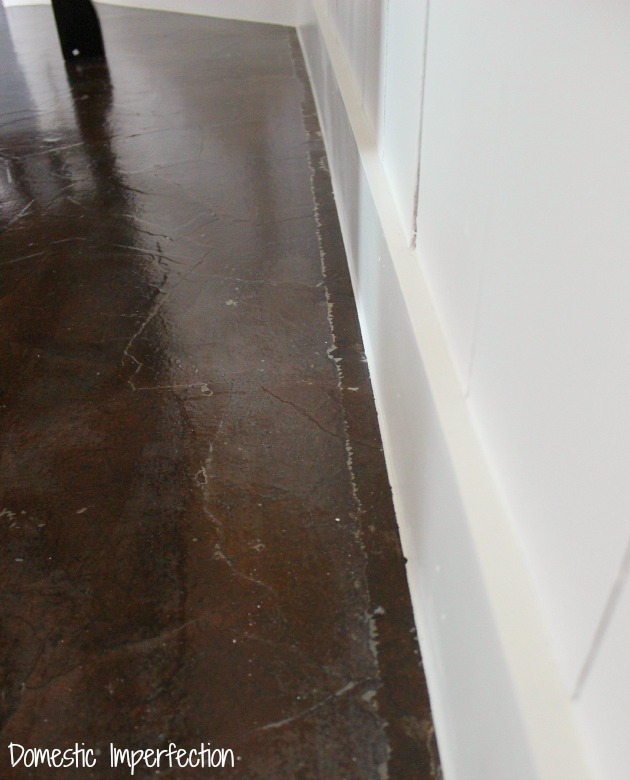 Love my floors…..they still look as great as they did the day I finished them. I love this idea for our basement floors. We’ve been told that dealing basement (or any slab floor) floors is a huge no no because water vapor can’t escape then and can damage the foundation. Could that be why is peeling? Greatful for any feed back!! Our basement has flooded a few times so carpet isn’t really an option. Thanks so much! We did our living room. With all the poly needed it came out to be as expensive as a cheap laminate floor and 100x the labor, in my opinion! We have plywood in the living room and concrete in the hallway. We followed all the steps for both surfaces and less than a year later we are now shopping for laminate. Our floors look AWFUL! Within a few months they were peeling up and chipping. Now they look as bad as just an unfinished plywood floor :/. Live and learn, but $400 for a floor that only looked good for a few months, was an expensive lesson. The labor was intense too! Never again. I did this treatment below the chair rail in my office and also covered a piece of furniture. Loved the look. I had some issues with the last bit of sealer. I think it was due to the active ingredient being absorbed by the paper, diluted the formula too much and it flaked. Fixed it by cleaning with vinegar, clearing any loose particles, let dry 48 hours, then re-coating with fresh urethane. Can this be done over vinyl flooring in a kitchen? I did it over the old Armstrong linoleum in my bathroom 4 years a go. Still looks great. Only downside, if there is one, is that you can still see the “tile” shapes. Oil residue possibly still in the troubled areas not cured/evaporated 100% yet so poly didn’t adhere. It is perfectly ok to mix the two types but stain takes longer to dry out due to weather, humidity etc. I am sorry if someone has already said that in a comment.You have a lot of comments and I didn’t read every one of them :) The floor looks great. I want to try it . I did the paper bag floor in a few of my rooms. I did it a little different than you, and my floor is holding up pretty nicely. One room is my dog room. We have a shepherd mastiff and a corgi, and they haven’t damaged the floor at all. I am actually really surprised. We also did the bathroom. There are a couple areas that are problem areas for me. However, the poly is holding up just fine. My husband rebuilt the entire floor, and we didn’t fill in the cracks before laying the paper bag flooring. Now, the flooring is cracking where the 5/8″ plywood meets. Next time, I will be grouting it, or something. As far as the mixture goes, I used 50-50 glue and water. Added a capful of brown RIT dye. Took a piece of torn brown paper, immersed it in the mixture, and wrung it out, giving it the wrinkly look. Then, we laid it out, overlapping it, slightly. Once dried, we applied 16 layers of polyurethane. Again, our floors look amazing, with the 4 kids and 2 dogs. The only problem areas are where we did not fill in the seams prior to laying the floor. I will be doing the rest of the house using this method. One thing I forgot to add. When we did the floor in the bathroom the first time, we tried to use a paint roller. It rolled on too thick and gave it a cloudy film look. Also, if it doesn’t dry evenly, it gives it a cloudy residue appearance. We actually reapplied the paperbag flooring and used the poly applier and it turned out perfect from that point on. I would suggest a water based epoxy from KEMIKO. Super easy super durable and thinnable. They also have a finish that is awesome and will build up over time. I have put everything from dollar bills to concert tickets on some of my basement floors. Absolutely beautiful if you can fix your problem area. Maybe a moisture issue. Is it over a bathroom or laundry room? I did all my bedrooms, hall and living room 3 years ago. The rest of my house, kitchen/baths/dining room/breakfast room are tile. I love my brown paper bag floors. I purchased extra sealer over them each spring. I have some marks and nice from the grandsons and will eventually replace it with tile or hardwood. Mine gets more wear from sweeping and mopping! I am so so so SOOOOOOOOo happy you posted this!!! I loooove updates and I looooove when bloggers are honest about their projects instead of only showing the good, and I hope to see more of this kind of thing in the blog world in the future. This is SERIOUSLY helpful to me as I’ve been planning on doing this for a while now! love this idea. I have used both types of poly and hate water based. In the past I painted my floors. In the living room I painted a faux area rug with borders and used leaves with a variety of fall colors on my rug and free handed a tile pattern in the kitchen and decoupaged cutouts from wallpaper onto some faux tiles. I moped with soap and water for years before we could afford the next floor covering. I think if you go with oil based poly you will have no problem. I apologize if this has already been covered as I didn’t have the patience to read all the posts. I have don’t this to my bedroom. I was very pleased until I got down to the polyurethane. I used a oil based stain and let it dry. Then used mini wax quick drying polyurethane. 3/4 of my room was nice and shiny with the exceptions of a few small places I had missed. There is also a large strip (which was the last part I had done) that is very dull looking. This was done 2 nights ago. I went back over those places tonight and it still looks dull when it dries. What am I doing wrong? I am officially doing this through my entire house!!! Such a money save and looks awesome. Do you think scrapbook paper could be used? I thought there would be endless possibilities with it, but would the polyurethane seep into the paper and make the colors look splitchy or greasy (for lack of a better word) in random spots? Any thoughts on using different types of papers? Btw thanks for all the great information!!! Rough sand the epoxy for a mechanical bond and apply a few coats of floor quality urethane over it. Honestly, having read all this. This is just a horrible idea! First of all it looks hideous, Second of all that’s ALOT of work, Third of all it may have last a year, but what floor doesn’t? Let’s see it in 5 years. I’m sorry to be mean. But this floor to look like that is not worth all that time. Daniel, i guess I’m not sure you felt the need to be mean and critical. If you don’t like it then why take the time to read this and look at it if not just so you could criticize someone’s hard work. Nothing is going to look new and great forever. In the future keep your ugly negativity to yourself. Thank you so much for this article. I followed your steps and even used the bona traffic sealer. I did this in my master bath, guest bedroom and living room. I love it and it looks amazing. It’s worth the extra $$ to get a top of line sealer like bona. I’ve had so many compliments on this. The most important factor is I have dogs, 5 small indoor dogs and it has held up magnificently. I have no complaints. Thanks so much for all your suggestions and how easy it was to follow your instructions. Mine did the same thing. But then I went into a local coffee house and asked how they did theirs because it has looked the same since day 1. That was 4 yrs.ago. pluse it looks like it did before the polyurethane. He said they used a regular water salient. Can this be done on concrete in the garage? I don’t think it would hold up well at all and a garage. I did this type of flooring back in 2004, did it in our mud room/computer room/craft room. You came into the room right from the garage. I never ever had any problems with mine at all. I used wallpaper paste to attach the bags then I stained with oil based stain and oil based polyurethane for floors. We left that home in 2012 and only 1 wore spot and that was where one of the wheels from the computer chair. Otherwise we loved it. 4 years ago I covered the linoleum in our bathroom. I wanted a floor that would go well with our 1950’s pink tile. A trip to the local art store provided me with lots of options. I ended up going with “Gun Metal” Grey, and now the floor looks like dark grey flagstone. And 4 years later, it still looks great. The grey paper floor brought a modern edge to the room. What should I do if I somehow got water under the paper bags ? polished concrete is also great in choosing flooring design. Easy to clean and has also gloss design. I did this flooring in my kitchen ( I used calender pages with wine bottles on them instead of paperbag ). I followed the instructions exact, put 9 coats of polyurethane on top. Looks absolutely gorgeous! The flooring is slippery so my dogs don’t go in the kitchen unless they need water, going outside, or eating. My family doesn’t wear shoes in the house nor are the kids allowed in the kitchen unless getting a snack or drink! I have a friend that did this in her sun room ( very busy, does all her entertaining in there) & she applies 1 coat every month, it looks great & seems to be holding up. I am in hopes that if I also apply 1 coat every month my kitchen floor will stay nice. The only problem I have encountered was a few scratches made by me. I waited for the floor to dry overnight (10 hours ) was a little overzealous & started putting my appliances back while floor was still somewhat tacky & it scratched in a few places. I have applied 3 coats of polyurethane over the scratches & they are sealed but has a bumpy feel when walked on it. 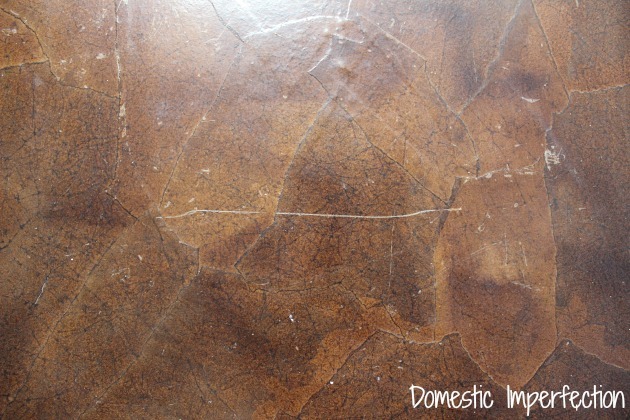 My friend ( same person who did this in her sun room )has assured me that over the next few weeks as we have guests over & they walk through my kitchen the bumpy feel of the scratches will go away with wear & if I apply a coat of polyurethane as it wears down it will be fine. Glad I found this, Crossing my fingers for a long floor life! Just found your paper flooring posts, and the idea is intriguing to me (and looks very cool)! I wonder if the reason that corner didn’t hold up well is due to moisture in the concrete, or seeping through somehow from the ground below. Maybe a layer of plywood or cement board on top, then papering that? I have a doublewide mobile home with a carpeted bathroom (ugh). I may have to give your paper flooring idea a try! Thanks for this useful list, I’ve been thinking about how to get around with only one check-in packMy brown paper floors are by far my most viewed content, at the top of the list for FAQs, and seen more on Pinterest than anything else I’ve done. I think that’s kinda cool for such an easy and cheap floor solution! But I cannot take credit for this method alone, I originally saw this idea in a magazine.I also HIGHLY recommend getting a piece of scrap wood and testing the technique with your stain and poly of choice. I get a lot of people asking for help after they’ve done the whole room because the paper isn’t sticking, the stain isn’t even, or the poly is cloudy. At this point, it is very difficult for me to help. The way I developed my method was by getting a piece of plywood and trying it out. Yes it is extra work, but it is worth it to know exactly how the floor will look. Please understand that I get a lot of questions about this technique, and may not be able to get back to everyone in a timely manner, but I do try. A lot of help can be found in the comments section. If I’m understanding correctly, the cribs were over the area that didn’t turn out right in the corner- My thoughts on the cause: ammonia lingering in the air and over that area from wet diapers or bedwetting. Hello Ashley, this is an amazing and informative blog, it’s great to know that we can use paper bag floor in a room. I would definitely try it at my home. Thanks for sharing this informative blog. Do you know how to remove it? I did it on my walls about 7 years ago and am ready for a change… Do you think wall paper remover will actually make it through the polyurethane soaked paper? Hi, do you know how to remove it? I did it on my walls about 7 years ago and am ready for a change. I was wondering if wallpaper remover will actually make it through the polyurethane soaked paper. I did this flooring about a year ago and loved it at the time. However it has started cracking and coming up. I’m trying to decide whether I can patch/repair the area that’s cracking or if I should just do a vinyl floor over it. Any suggestions? Your Poly most likely degraded like that because of the floor lamp. Poly is sensitive to certain wavelengths of light & will degrade. You can get Poly with UV stabilizers but it can be hard to find, or you can just re-Poly when it starts degrading. I am a contractor that has installed and applied many a floor. 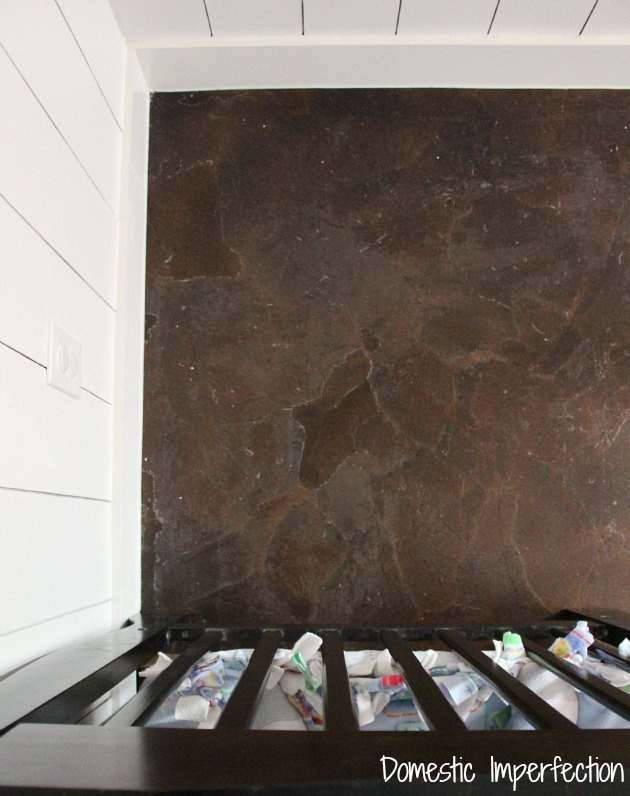 Paper bag floors are cool but do it right and you won’t have issues like this. If you use urethane epoxy as your top coat you will never have this problem. Hi! My husband & I have been renovating a 900 sq ft 1883 home that has wood floors. Due to the extreme damage and neglect the house was left in for over 30yrs before we acquired it, the original tongue and groove floor in the bathroom was beyond saving unlike other floors in the house. We are finally at the stage in the bathroom where we can actually “finish” the floor. We have had marine grade lumber in there now for quite sometime and are kind of wanting to try the paper bag method in the bathroom. I did our living room ceiling in tissue paper two yrs ago and it still looks amazing, so I figured if I can pull that off perhaps I can pull off papering the bathroom floor. I am concerned if this will hold up to moisture even tho we have marine grade wood on the floor. I am also wondering if marine grade sealer would work with the paper. We could put lenolium but, we’ve come so far in making the place stay period looking, I don’t want to compromise the feel, however, I am also a realist and on a super tight budget with this project, and really want and need our efforts to last a very long time, so, budget wise, we could use lenolium we have left over from another flooring project or try paper bagging, which to be honest, we do love the look of the paper. I’ve watched many videos and read articles on the paper bagging of floors, I don’t seem to run into too many people using this method in the bathrooms. Worse case senerio, we can sand and just stain and clear coat the existing flooring and leave as is or, paint it. I really do like the sunbleached example you did. That actually would go with the walls I recently painted in the bathroom of this house. I looked into the different craft papers on the Home Depot website and so far there is a builders paper that has moisture block in it which is a plus. If anyone has any input on doing this paper bagging in the bathroom, I’d be fully open to get your advice. Thanks for your inspirations, advice, and also for sharing the good and the ugly of this project. Hi, I did 2 bedrooms in 1974 with some fabulous french wallpaper I found for 2.00 a roll. My mother knew how to paper, so she helped. It was put down exactly like you would paper a wall. did not use special glue or pull up the old linenoleum. husband sealed it with 2 part epoxy. 6 yrs later when we moved , it still looked brand new. Wallpaper floor , two parts epoxy what was the other part made of or did you mean two coats of epoxy? I wonder whether you have moisture coming up from below in your problem areas. Has anyone done this on top of a coat of kilz paint? I am getting ready to finish our bathroom floor in a very old house we’ve been working on forever. 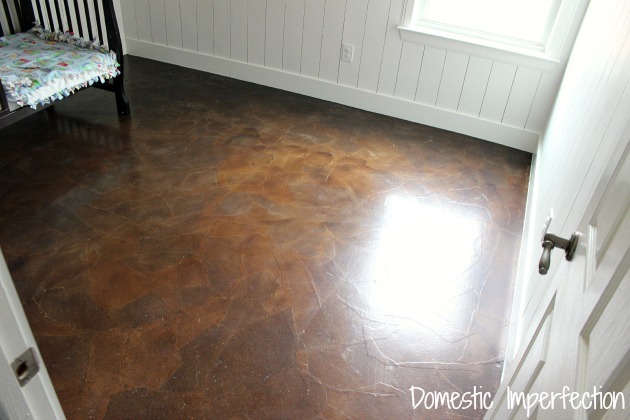 I want to try this floor but very nervous about using it in the bathroom because of moisture so I am hoping someone else has done this and the project was done awhile ago? It would be nice to know how its done in a bathroom over time. I did our ceiling in the living room with tissue paper and paint and the results were beautiful and after three yr’s, it still looks like I just finished it. For the paperbag floor if we go that route, my husband is thinking “gem coating”. Gem coat is like lacquer (sp). An Uncle of ours used it on his floors and on furniture he redid. He used to live in New Orleans and to get his wood floors looking and staying fabulous, that is a product he used. He also used it on wood floors in NM. I’m thinking perhaps, that might be the way to go in the bathroom if I decide finally to do the paperbag. I do love the look of the paperbag. The floor I’m working with is tiny. I think what will push me to go for it, is if I can hear thoughts and results from someone who has paperbagged their bathroom a yr or two ago. I’m wondering if this will work on top of the base unfinished wood that’s under my carpet that I tore out. Thank you! Yes! The tutorial I followed did this over wood, I was completely experimenting by trying it on my concrete floor. I did a paper bag table top in a bar. I started gluing the paper bag pieces down with Elmers glue, or some sort of school glue. It didn’t want to stay very well so i switched to Gorilla glue and got it all over my fingers, smoothing down the edges. I let it dry then put polyurethane over it and it is beautiful. It was after this project was done that two of my customers told me the did this on their kitchen floor. I love the idea and it is cheap. Thanks for all the advice, so glue goes on both sides of the paper? Then stain? Wow I am impressed with how well it turned out. So sorry to hear the tape messed it up. I am on disability and money, lifting, body strain etc all are a factor – but when an RV dealer sold me a tin can palace it wasn’t pretty. I’m thinking the paper bag flood may just be the solution to at least one problem. When I do it, I’m thinking I might do did wall panels before fixing walls and experiment on cupboard doors, too. 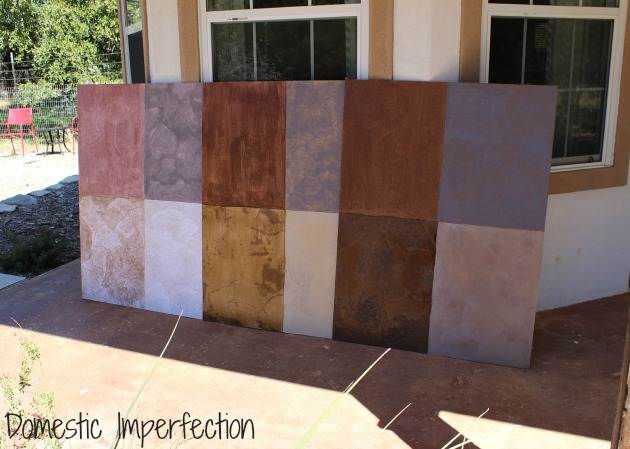 Subtle stain colors may work to make it not so Unicom and boring. Any thoughts or suggestions would be more than welcome. Thanks for your article. I’m remodeling my Grandmothers home. Underneath that ugly pink carpet she laid down, she has BEAUTIFUL wood floors! WTHeck G’ma?? Anyway… The bathroom sadly isn’t going have wood flooring because of damage it has received through the years so it’s all gotta go. Plus, we are opening up the concreted garage as a family den. I’ve been looking at flooring ideas that fit our needs 1.) will match the dark stained oak floors without clashing, 2.) Hold up the average daily use, 3.) Unique & beautiful. I think THIS may just be the 1. Has anyone put this in a main bathroom? If so, how has it held up with the continuous water contact? Does anyone recommend maybe a clear non-adhesive/tear resistant/non-fading plastic or vinyl covering to lay over the flooring for added protection? There HAS to be something out there that can be adhered JUST around the edges under the trim to help protect the flooring. Loved the videos, were thinking about doing this in an older RV we have been fixing up. Anyone have any thoughts? I’m fixing to do my 8 year old son’s room. In the process of pulling carpet. His room is right next to his bathroom, he over flooded his toilet and got water damage to his carpet. How many coats of poly you think I should apply to make sure that water won’t damage the floor ( in case the bathroom mess happens again). Also what is the best stain and poly to use? Thank you for your time and assistance. hello this mean the paper is glued over floor tile? Can you do the paper bag application on a subfloor or does it have to be over carpet? I have a question. Do you think if I used a color craft paper other than white it would have like a marble look effect? did you consider adding the stain to the glue slurry and eliminating a step? Have you tried adding the stain to the glue mixture? I am working on a craft paper floor right now. By accident, I discovered that the color I wanted the floor to be was the color of the latex paint I randomly used to paint the cement floor after reading that you have to paint cement to get the paper to stick well. So I am working with latex painted craft paper, and while I worried some about the paint coming off in the gluing process, since it’s water-based paint, not much does, and it looks pretty natural where it does. The big problem I am having is an area where the floor is lumpy and I can’t seem to get it flat enough to blend with the rest of the floor. Lumps happens to be front and center. I used some filler over my first layer of paper and am laying down new paper in that section to see if I can fix it.